The chrysanthemum stunt viroid (CSVd) causes severe stunting and significant reduction in flower yield and quality of commercial chrysanthemum (Chrysanthemum morifolium). The pattern of inheritance and the detailed mechanism underlying CSVd resistance remains unclear. Chrysanthemum morifolium shows unstable and variable chromosome numbers that form a hexaploid complex with aneuploidy. To overcome the issue of complex hybridity and polyploidy, a diploid wild chrysanthemum, C. seticuspe f. boreale was used here as an alternative model to C. morifolium. We screened 20 C. seticuspe accessions for resistance to CSVd and identified one resistant accession “AET-19” showing resistance. 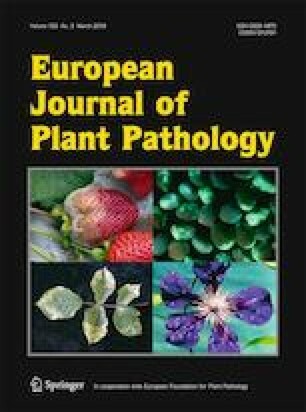 Tissue print hybridization analysis showed that CSVd concentration decreased in the uppermost leaves of the AET-19 after the scions were cut from the infected rootstocks, suggesting the resistance seems to be ‘CSVd-disappearance type’. In situ hybridization experiments revealed that CSVd does not invade the shoot tip of AET-19 plants after graft-inoculation onto infected rootstocks. Taken together, the results highlight the usefulness of C. setiscupe as a model for analyzing the mechanism of CSVd resistance and its pattern of inheritance. We are grateful to M. Nakano (Hiroshima University, Japan) for helpful comments and discussion. We thank NBRP Chrysanthemum (http://shigen.nig.ac.jp/chrysanthemum/) for providing chrysanthemum accessions. There are no potential conflicts of interest, and this research did not involve human participants and/or animals.